← Catching the Nubious Knuckleball! GFBB Note: “If Obama can schedule out a World Series first pitch, he will join Franklin Roosevelt as the only other president to have ever thrown out an Opening Day, All-Star game and World Series first pitch. With today being President’s Day, I thought I’d commemorate the occasion by putting a baseball spin onto things, and covering an abbreviated history of United States Presidents who have thrown out a first pitch at a Major League Baseball game. 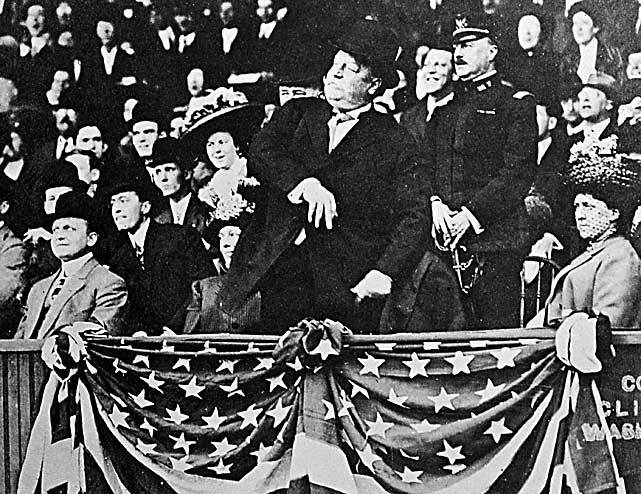 The inaugural presidential first pitch came back on April 14, 1910, when William Howard Taft (seen above) threw out the first pitch to Walter Johnson, on Opening Day for the Washington Senators, at National Park. Taft did so from his seat in the stands, not the pitchers mound, as would be the tradition for many years to follow. Since Taft, every president has thrown out at least one ceremonial first pitch, with Franklin Roosevelt having thrown out the most first pitches, with eleven. Roosevelt also holds the distinction of being the first president to throw out the first pitch of an All-Star game. Definitely good stuff. I can’t believe the baseball season is almost upon us!